If you’re a freak or a geek, if you’re strange or deranged, if you feel like an outsider then come along, climb aboard… for I would like, if I may, to take you on a very strange journey. You must be 18 with ID to purchase your ticket. All minors must be accompanied by their parent. Waivers will not be accepted. The Rocky Horror Picture Show was released as a film based on the original stage productions in 1975 to a mostly negative critical reception. Fortunately for us, the movie began a midnight run at the Waverly Theater in New York City on April 1, 1976, and Rocky Horror as we know it began. Now, over thirty years later, theaters across the country still run the movie at midnight, with the same enthusiastic audience participation that began in New York. 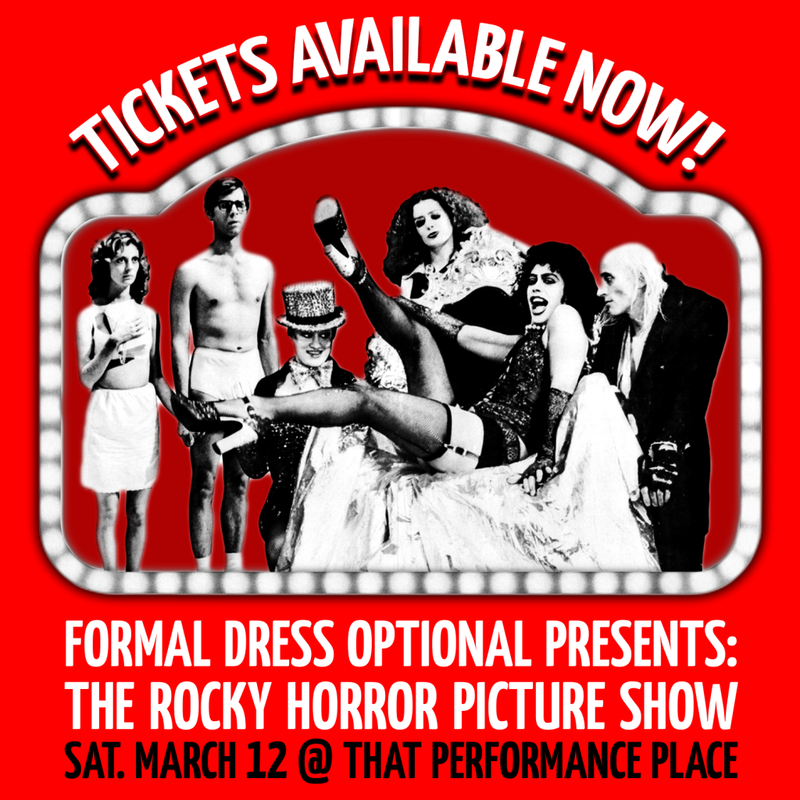 Formal Dress Optional is Delaware’s longest running Rocky Horror shadowcast! Join us for Second Saturdays at That Performance Place in Wilmington, DE. We encourage audience members to participate in the festivities, including dancing the Time Warp, shouting jokes and obscenities, throwing props at each other (and you! ), and generally having a good time. Visit www.formaldressoptional.org and www.facebook.com/formaldressoptional for more information on the show.